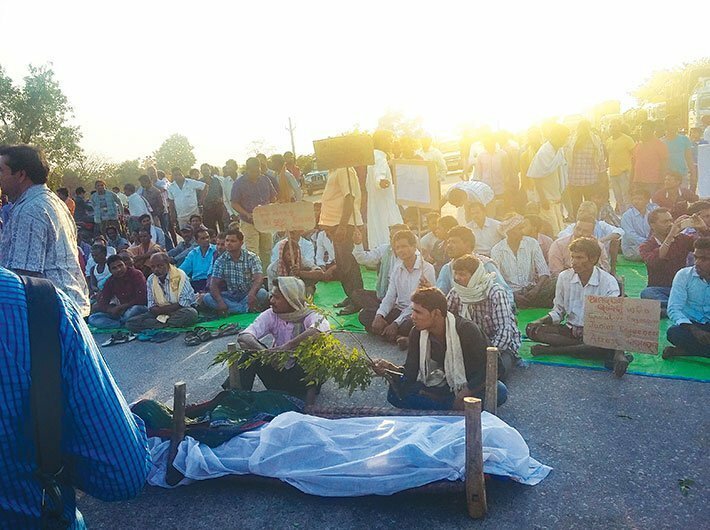 There are different arguments for the farmers’ agitation which first caught Maharashtra in its octopus grip and then spread to Madhya Pradesh where six people were killed in police firing. Unaddressed demands like waiver on loans, better prices for agriculture produce are said to have triggered violence. This is agreed. But the question is why did the farmers resort to violence in the BJP ruled states? Why didn’t it happen in Tamil Nadu where farmers protested and took out rallies in support of their various demands? Remember when their demands were not met they rushed to New Delhi where they indulged in grisly antics like drinking urine, eating faeces, and showing the skulls of farmers who they said had committed suicide. For 40 days they continued with such horrific acts at the national capital’s Jantar Manter area, yet never resorted to violence. Why? The answer is simple: Tamil Nadu farmers didn’t receive political support from opposition parties as much as their counterparts got in Maharashtra and Madhya Pradesh. However, instead of indulging in blame game as to who did what, there is need for serious introspection on the kind of politics our political masters want to play in the country. Fulfilling poll promises, the Yogi Adityanath government waived off over Rs 36,000 crore farmers’ loan. Several economists criticized the move and warned the Centre about its consequences. They had forecast that the move might have a domino effect and farmers from other states would demand the same from their respective governments. It has proved true in Maharashtra and Madhya Pradesh. But loan waiving is not the only issue for farmers. They are also asking for higher price for their produce. They also demand that the Narendra Modi government should, in accordance with the BJP’s 2014 poll manifesto, implement Swaminathan committee formula under which the minimum support price (MSP) would be more than the weighted average cost of production. In the absence of fulfillment of these demands, cashless farmers are not able to understand what to do. They need cash to buy seeds and fertilizers as monsoon is approaching fast. They don’t want to go to mandi to sell their produce as it would not fetch them the price they want. In this background, a pertinent question to be asked is where is the prime minister’s promise of doubling farmers’ income? Even if it is to happen by 2022, there should be some visible signs to show that he is serious on this front. Instead, his government removed a 10 percent import duty on wheat last year and imported million tons of wheat from Ukraine and Australia. The country had reported bumper crop yield last year. Again, it imported tons of ‘Tuar dal’ last year in spite of its bumper production. To compound the problem, the hapless farmers find that their young ones are not coming forward to carry forward their profession. Unlike their fathers or grand-fathers, they don’t want to sweat it out in farmland and earn meagre money; they want to live in cities with comfortable jobs. The current violence is attributed to deep seated frustration, disillusionment among farmers. And this can’t be resolved by undertaking a fast or other political theatrics, but by fulfilling promises made to them and understanding the ground realities.